Apple has done it again with the release of the iPod Touch 5th Generation. This ultrathin media player is more like a multimedia juggernaut on steroids than another beefed up version of the iPod or a mini version of an iPad. The device stands alone for its similar design to the iPod 5 and its additional features include a 4 inch display screen. Still working on the iOS 6 operating system, the device features an Apple A5 processor. This iPod Touch also has a special added feature of Panorama mode for its front and back camera with 5 megapixels that can shoot video and includes an auto focus feature for taking pictures. Such a device can supply up to 40 hours of entertainment with audio, video and photos, including the ability for synching with iTunes accounts. A device like the iPod Touch 5th Generation makes a great gift for the holiday season. Priced at just under $300 for the 32 GB model, the multimedia player offers enough data storage capacity to hold hundreds of image and audio files along with video. College students can utilize the microphone feature to record class lectures and get up to 40 hours of audio playback. This device makes the perfect travel companion with its wireless capabilities for long delays between flights and airplane mode for viewing videos or listening to podcasts or audio books. Commuters will fall in love with the multimedia functions of the device that can make a subway or bus ride home or to work fully entertaining from start to finish. Add on the special wrist band and take this next generation iPod Touch on the road for a morning jog or to the gym for an energized workout. Undoubtedly, the multimedia gadget offers its users more features than previous versions and its MP3 competitors, while it undersells its portable game console competitors. 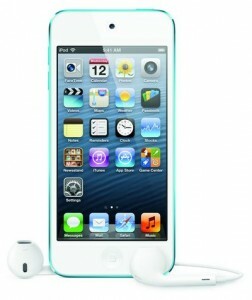 Apple continues to enhance the level of quality products available on the tech device market with this new iPod Touch. The latest edition of the iPod Touch comes in a variety of colors, including snazzy red and metallic silver. Apple also offers a plethora of downloadable applications through the Apple Store. Additionally, the device’s firmware may be upgraded and the device can also be synchronized with a desktop through the Mac OS or Microsoft Windows operating systems. For the price, the iPod Touch 5th Generation stands out as a major difference maker in the tech market. This entry was posted in Articles, iPod and tagged iPod Touch 5th generation. Bookmark the permalink.